Over 35 years ago, in a now-famous study dubbed the Stanford Pison Experiment, Professor Phil Zimbardo showed that ordinary people will do extraordinarily terrible things when placed in the right situation. On April 4, in a filled-to-capacity lecture in the Ames Courtroom, he used the results of that experiment and other psychological studies as a lens through which to view the prisoner abuses in Iraq’s Abu Ghraib prison. 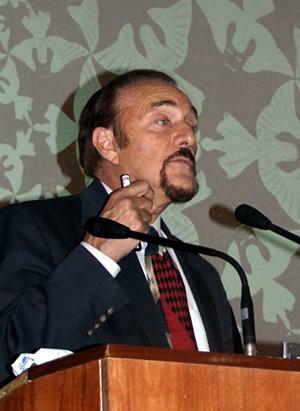 Zimbardo’s lecture was based on his new book, The Lucifer Effect: Understanding How Good People Turn Evil. He began with a simple assertion: the commonly held view that bad actions are a result of bad character is wrong. 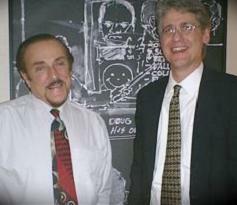 “I have a different view of what makes people do evil things,” said Zimbardo. More powerful than personality, situational and systemic factors are the true causes of terrible acts, according to decades of research by Zimbardo and other social psychologists. These situational and systemic factors struck Zimbardo as plainly evident when documentation of prisoner abuse in Abu Ghraib surfaced in the spring of 2004. Detailing the results of numerous psychology experiments, he sketched out the conclusion that the potential for abusive treatment of detainees was entirely predictable based on a fundamental understanding of the principles of social psychology. Using the story of one soldier who was tried and sentenced for the abuse, Zimbardo discussed how situational and systemic forces were implicated in the atrocities. 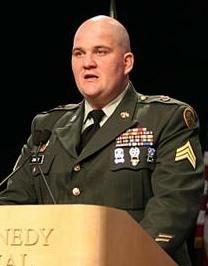 Before his assignment to Abu Ghraib, Staff Sgt. Ivan Chip Frederick had received nine medals and awards for his military service and had a stellar employment record as a guard in a small correctional institution. In the dark confines of Tier 1-A in the Abu Ghraib prison, Frederick worked 12-hour shifts for weeks on end without a break, in an environment soaked in filth and noise and under constant attack. He was given responsibility for one thousand prisoners and was neither trained nor supervised. Situational factors such as these, said Zimbardo, along with systemic factors embodied in the Military Commissions Act of 2006, predictably resulted in evil outcomes. Zimbardo’s talk ended, as his book does, with the bright inverse of his theory: just as ordinary people can do horrific things, they can do heroic things. He defined a hero as someone who overcomes tremendous situational forces to perform an extraordinary moral deed, and pointed to, among other examples, the soldier who exposed the Abu Ghraib abuses. The lecture was sponsored by Harvard Law School’s Project on Law and Mind Sciences (PLMS), Program on Law and Social Thought, ACLU-HLS, the American Constitution Society at HLS, [Unbound: Journal of the Legal Left, the Kennedy School of Government Center for Public Leadership,] and Harvard University’s Edmond J. Safra Foundation Center for Ethics. HLS Professor [and Situationist contributor] Jon Hanson, who delivered the introduction to the lecture, said Zimbardo “did an amazing job of demonstrating some of the unsettling discoveries of social psychology and their implications for law and policy.” Hanson said feedback from the event was “incredibly positive,” and that PLMS hopes to continue to bring prominent mind scientists, as well as the legal scholars who rely on their work, to the law school. A video of the lecture is now posted on the PLMS website and blog this week, which can be accessed at http://www.lawandmind.com. Update (04/18/07): To view the video, click here.